Hashcat OpenCL benchmark of WPA cracking, when GPU is still cold. Running Hashcat multiple times, I saw something that I wasn’t happy about: some form of GPU throttling. It started with full blast aka GTX 1080Ti @ ~560kH/s and GTX 1060 @ 206kH/s and overall performance of ~1200kH/s down to about to about 800-900kH/s after just 10 minutes of workload. So, what is happening? Thermal throttling? But why? To answer that question, we have to look at fans and what are they actually doing: when GPU approach threshold of 80 deg Celsius, fan start to trail temperature, so it doesn’t get more than 85 deg C, but at the same time you see that soon after reaching 80 degrees, GPU clock start to swing downwards, resulting in slow down of hashcat. What is even funnier: fans rarely go above 50%. Force fans to run at higher speeds, thus reducing GPU temperatures and avoiding thermal throttling, albeit having a noisier environment. Reduce power output, so it doesn’t heat up that much, thus reducing total system power requirements. As you can see 90% of fan speed reduced GPU temperature to 79 deg Celsius at 100% usage. Which will change fans speed to 100% on all my cards. So, no more thermal throttling! If you look at the menu, you’ll find that we can increase GPU clock speed offset to healthy +200MHz without any problems, as well as -1000MHz for memory clock, to reduce a bit heat on them, without any implications. Just because it says 2100MHz, it doesn’t mean you will get there, but there is some headroom for improvement just in case. But… that 850W from the wall… Let us do something about it too. Specifies maximum power management limit in watts. In my case GTX 1080Ti is 250W and GTX 1060 is 140W by default. You will have to have an Administrator powers to change these options and they are there only until next system restart unless you use option: -pm, persistence mode, but I prefer to set up power limits before I’m using hashcat, so when I boot up my system again, everything is back to normal. to get constant updates how your GPUs are doing: fan speed, GPU temperature, load, etc. Your mileage may vary, so be aware of that. As usual, I do not take any responsibility for any damage to your system. Those things can end up destroying your card/computer etc, so you do modify them on your own behalf. I love Kali Linux (previously Backtrack), there is no “buts” about it, but… I’m not that great with all things Linux (I will get there, one day 😉 ) and things I’d love to do, are kind of “more advanced” than I would like to participate with. Why do I need CUDA/OpenCL? I love to play with passwords, WiFi… you got it. To test the strength of encryption, I use hashcat program, which can accelerate cracking via OpenCL graphics card hardware assistance. That’s why I need full NVIDIA driver to get that hardware assistance. To write this small guide, I was forced twice. First time, I’ve installed my 3 NVIDIA cards when I build my workstation about 2 years ago: GTX 1070 8GB, 2x GTX 1060 6GB. It was doing about 450kH/s cracking WPA2. Not bad, consuming about 380W totally (whole system). Yeah, as always my installation was fine, but I could not boot to Kali desktop, it sits on the boot without any movement… again. …and try to reinstall failed package again. Save and reset computer, after that hashcat should not complain again. Christmas this year came to me earlier: Finally got second NVIDIA 1080Ti!!! Using my pfSense router for a while, I saw spikes of 50% and sometimes 70% when downloading Windows Hyper-V updates. It turned out, that ClamAV was the culprit of checking in real time and slowing things down. Yes, I know. It is task intensive and adding things like Snort and PfBlockerNG does not help either. Behold… The i3 enters with 4130T 35W (it’s 4130 but with chopped cohones, aka lower TDP), dual-core (2 cores 4 threads), 2.9GHz and no turbo, benchmarked at 4133 points (nearly twice of my 1220L v3). Can be purchased for about £45. It has AES-NI, can utilise ECC with Cxx chipset, has all of the Xeon features, but no trusted computing, no turbo. After installation first positive impressions: power consumption didn’t increase at idle and at full speed 100% on both cores, maximum usage was… 45W total. WHAAAT? Is only about 8W increase utilising full speed? I can live with this. Finally, we are here. What is all about TDP? People often confuse it with current consumption or maximum consumption (kinda). TDP acronym translates to Thermal Design Power and it is maximum heat output of the processor stressed out to the max. Simply saying if you utilise your CPU at 100%, it will emit TDP in Watts of thermal energy into the cooler via heat. It is important to know that the T (i3) or L (Xeon) versions of CPU have reduced clock and are undervolted as well. In my case Antec ISK300-150, there is no much space, even if my CPU cooler can dissipate temperatures from most of the big CPUs, but not in this tiny case. Also, my motherboard cannot do underclocking nor undervolting CPU, so I am stuck with default maximum speed. This is where T or L versions come in very handy. my i3 4130T has TDP of 35W and it idle at around 45…50 deg centigrade, where 1220L v3 was comfortable at 36…40 degrees. Now, if I open the case it drops to 33…36 degrees. All that with 27 deg centigrade in my room. Not bad… Not bad at all. I didn’t want things super new and latest generation, simply because they are expensive. Yeah, I know, they have a better power consumption, speed but also premium. I want ECC, this means I need a motherboard with Cxx chipset and ITX form factor, that means new=expensive. Also, AES-NI on my CPU, so no Celerons, no Pentiums and because of Cxx chipset NOT working with i5 and i7… all I got left is i3 or Xeon. Then I saw it: Xeon 1220L v3, 1.1GHz with turbo 1.5GHz, it has ECC, AES-NI, 15W TDP (this is a little of BS, but I’ll explain it later) and cost £35 used. Got CPU, what about the motherboard? 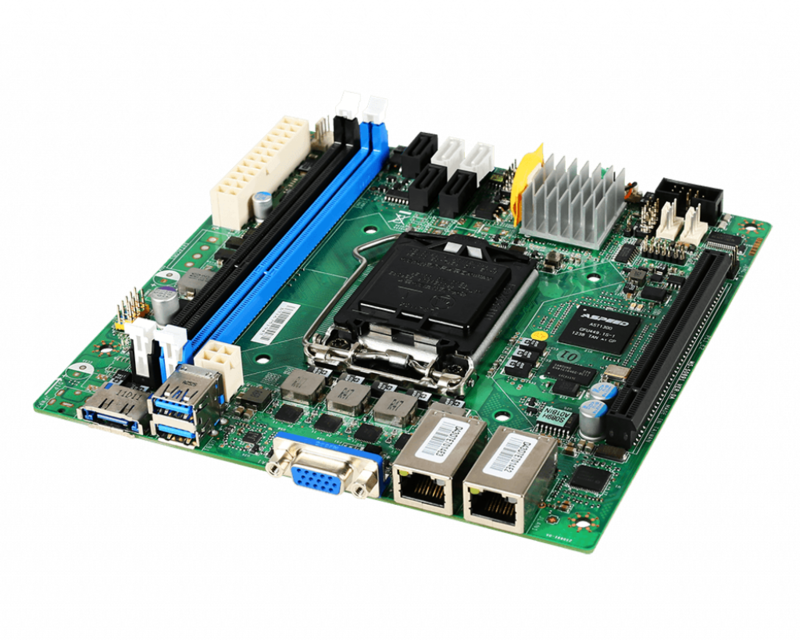 Digging into eBay and found lovely, new(ish) MSI MS-S0891, LGA1150, ITX, C222, ECC ready board, IPMI (didn’t get it going yet BTW) for £78, but without a back shield. I couldn’t believe my luck and it has 2 Intel LANs, OMG… I’m happy!!! RAM: 2 sticks of 4GB ECC 1600MHz was just a quick transaction. Next was the case: remember, small… Soon after browsing few forums, I got something like Antec ISK300-150 with external (important!) power brick. There is one with internal power supply, but it is noisier and heats up like a toaster. It fits exactly into the board and is one of the biggest coolers you can fit in this case and one of the best. Also, is bloody expensive with cheapest I’ve found at £45. I got mine without a back plate (again?) for £30 and used 4 separated bolts instead. Alternatively, you can do it with standard Intel CPU cooler for £5, it will work as well. As I didn’t expect to have 2 Intel NICs onboard my motherboard, I chose to purchase Intel 1000 VT LAN PCIe card with 4x Intel NICs. It has low height bracket option, fitting perfectly my ISK300 case and you can find on eBay for around £30-£35 pounds. Why VT and not MT? Same price and the first one has few options more useful for virtualisation. Keep in mind that this card will add about 5W of power to total consumption. This is how it looks fully assembled. It will stress both cores using AES-NI (if you have it), so for me, it was around 40-42W and having a peek at pfSense/System Activity to ensure 2 instances of OpenSSL are running on CPU 0 and CPU 1. This command will ensure to run the same test but without AES-NI on the CPU, so 100% usage, both cores. The result is nice 46W max. Great! Upgrading firmware to the latest wasn’t the problem: the problem was that I had UEFI bios on the motherboard and original firmware on M1015 and could not start a boot menu called WebBios to create my RAID10 array. Bummer. The remedy was to switch from IBM firmware to LSI/AVAGO ( there is more info on the subject, have a look). WebBios was enabled (funny enough, I did not have this problem with my other motherboards using normal/old BIOS, only with new UEFI) and I could create my first RAID10 array. It takes a long time to boot. A BLOODY LONG TIME. Like 20 minutes? Heh???!! Back to basics. Speed? Should be around 300 MB/s read, yes? CrystalDiskMark to the rescue and I were shocked one more time… 60MB/s sequential read and 20MB/s sequential write… don’t start me on the random r/w… CARRAMBA. STOP. REWIND. WHAAAAT???!!! It cannot be. Nope. It’s RAID card, 4x 1TB WD each can do 120MB/s easy, so… whats the problem? Digging around forums for few days, I’ve found out, that M1015 is just HBA card with “added” raid option and CPU on this card is to slow for anything else but a straight RAID 1 or JBOD, even if you have more options like RAID 10 or RAID 5. Sad, but true. OK, let just remove RAID boot option, reflash it with latest LSI firmware and use it in my NAS4Free fileserver as straight HBA card. Done! Ordered on Fleebay nearly “new” ServeRAID M5015 with BBU (battery backup unit), I was able to import old M1015 array without any problems, even if it was created under M1015 with LSI firmware, not IBM. Soon as I connected drives and boot my PC, I was asked if I want to import located array as RAID 10. Speedwise? Nearly 450MB Reads and 350MB Writes. Happy like a bunny now! As you can see, value 4 equals to 60 seconds. I think, IBM servers having a long post, so they can make sure that all HDDs are running full speed before raid card gets online and drop some hard drives from the array. …and this is it. Reboot computer and the whole post will be very short, from the 1st posted message by raid card to actual boot. For now, I am still unable to get WebBios working, but at least I don’t have to wait for it anymore. If one day, I need this option, then probably replacement firmware from LSI/AVAGO will be my choice. Lastly, I replaced all drives for WD 1TB Blue x4 and created a nice, 1.86TB Raid10 array and guess how long took me to do a full restore from backup? About 1 hour. NICE! One day, tinkering with my pfSense, I was quite annoyed about how long it takes to boot up my box to get it to the user interface. OK, I had an old 2.5 HDD 320GB from Hitachi, it was bulletproof TBH, but soo slow. Not long time ago, I saw one of 2.5in, 500GB Seagate SSHD FireCuda hybrids – ST500LX025. Fast 8GB SSD inside of normal HDD, up to 140MB/s transfer, SATA III. One way of saying: NICE! Normally, I would not use full SSD in something like pfSense, due to wear and tear, but… an idea, that internal SSD is only utilised for the most often used files… it kind of appealed to me very quickly. Let restart system a few times and it should get updated onto internal SSD. Let’s see. Installation was very straightforward as usual and in about 800 hours later, I had a peek at S.M.A.R.T. details and I was gutted. Not again. All that singing and dancing about “green drives”, “save the environment!” usually end up truly with saying: “Penny wise – dollar stupid!”. Why? Let me rumble a bit: This is about the third time I have to resort myself to digging around the Internet to find out how to disable something, I don’t really need it and it was quite difficult to find info about it. OK, I’ve saved few watts on electricity having all those fancy features on, but wasted a much more looking for the way to disable them. Let me show you SMART features after some 886 working hours. Basically… warranty last 5 years… but the drive with all those cycles may not. Having already NAS4Free and problems with way too much head parking, the solution is exactly the same: TURNING THIS BLOODY THING OFF! Now… check the SMART features and you should see that those counts are not changed as often as it was before. It should also survive a reboot of the machine, at least it did on mine so far. Forcing standby timers to 3600 seconds = 1 hour of inactivity. Going back in time, my first Wi-Fi router was the US. Robotics USR8054 802.11g Wireless Turbo Router with its 4x 100Mbit LAN and turbo Wi-Fi nobody else could (125Mbit) use and if I had >3 Wi-Fi users, it often died instantly (first Wi-Fi than LAN). It was a good router at the time and if nobody run torrents… At the time it was fine (especially, when I replaced original firmware with DD-WRT). Next was Belkin 54G, luckily in this version, I was able to replace the firmware with DD-WRT. Here, I was actually starting to be able to kill it with high demands. It was beginning of time, where all those mobile devices start getting access to the internet over Wi-Fi and all my previous home routers start showing age-related illnesses. Running on 300MHz CPU and having few MB ram wasn’t enough for more than 5 devices at the same time. Of course, having my desktops running Gigabit Ethernet but running in Fast mode didn’t help either. So, I bite the bullet and ordered from Korea (£68 vs £110 in the UK) the Speed Deamon: D-Link DIR-825 B1. Then I found TP-Link Archer C5 v1.20 (DD-WRT and OpenWrt capable, with the same hardware as C7 v2.0) for £49.00. I do not have to think twice… 128MB RAM, 720MHz Archeros with original firmware OK for more than basic setup, Gigabit Ethernets, 11AC, dual band. To run on Virgin Media (VM) 200Mbits more than I need it. Of course, I wanted to test it with the latest OpenWrt, but discovered that unfortunately, there are 2 major problems (not a problem as per se, but…): Firstly, because of not using hardware NAT (and thank you for that, seriously :-)), the WAN -> LAN speed was half of its original potential (but then even for my VM 200Mbits, it was still within its range of around 300Mbits). Secondly, the 11AC Wi-Fi part was proprietary and neither OpenWrt nor DD-WRT was able to get it right, there was always some problems, sooner or later. So… I have 6 mobile devices, TV with Wi-Fi, NAS, Satellite box, AVR with internet radio, 2x Desktops, Media Player… not much, but what if I want to run OpenVPN for whole house? 6..8Mbits max on Archer C5 and Gargoyle firmware… Again, no hardware AES and what’s the point to have 200Mbits, but use 8?? As you getting older and have kids, you start to see internet as place, where you need to take control of what’s going in and out from your network and I got to the point after having experience with many different kinds of consumer routers, that Wi-Fi routers cost more and more, have many good features and hardware tricks, but they are 5 years behind everyone else. How? My Mobile phone has 1GB RAM and dual-core 1.4GHz CPU and is from 2011, but I saw dual-core ARM 1.2GHz on the Wi-Fi router at the end of 2015 with its 256MB (1/4 of my mobile’s) and there are (in 2016) about few devices with dual-core and >128MB RAM… Disgrace and if you add to the insult, that firmware side of those devices, is often rushed and not complete or fully tested, where proprietary drivers making it unsuitable to change firmware, you will end up with a very expensive toy, all singing and dancing, but unusable for anything more complicated than manufacturer anticipated. If I want to, let say use OpenVPN, block pages via keywords or IP address (yeah.. I know, some of them can, but it’s usually limited to few words or web pages) or anything more… you are not looking at the consumer router at all. Having Media Player build on Intel CPU (in my case, it was Intel Celeron G1610) and fully featured ITX motherboard with full-width PCIe 3.0 x16 will give you something to think about. This whole setup as a media player was (including PICO PSU 150W, 2GB RAM, 2.5″ hard drive) doing about 30W with full HD movie on. OK, my router Archer C5 is doing max 5W, so I’m at loss of 25W, but it cannot do what I wanted, next one will be Linksys WRT1200 based on Marvell (AES supported) but costing around £120, if not more and pooling about 10W full on. It can run OpenWrt, but 11AC has its own problems. So… What’s next? Answer: PFSense. Simple. Running on x86 CPU like your normal PC… It just blows your mind this thing can do. Will I want to get another router in the future? No. Way. In. My. Life. Why? Let’s get to it: Why we buy £100-£300 Wi-Fi router? Looking cool? Don’t care. I got my case passed from NAS to Media Player to my PFSense router. It’s fine. Antennas? Don’t need one, still have my Archer C5, I’m using as an external Wi-Fi AP. Why? Looks cool, works fine as AP, doesn’t route anything, just transferring data. Simple. Even 200MHz CPU can do that now and I got there 720MHz. Great. Whooa… Intel G1610 will blow all those MIPS or ARM CPUs out of ANY water few times in the row. Archer C5 does 5W max, Linksys WRT1200 will do 10W… my Router with Intel Pro 1000VT will do 40W… Probably. Who cares. Difference between power consumptions will be at max 35W and with my prices of 12 pence per KWh, will yield around £3.50 per month. This will not change much because I have enough CPU power to overtake my network needs 5 times, so I will not buy any routers in near future unless something breaks, but then anything can happen. PFSense is updated every so often including latest security patches, will your router get that? No way. Not possible. I can run PFSense or IPFire or anything else I wanted… Even Windows Server if I had money for it. In the end… the only problem is, that it is not a plug-and-play solution. You need to know more or less what you want from your network and what you want to do with it, but judging by the need to change your router, it is time to get another look at x86 systems. Problem is quite simple to remedy: replacing the fan with something much quieter and while you at dismantling the case (hold by 4 screws inside of plastic feet and smaller screw at the bottom of front cover), you can vacuum inside. When installing your new fan, you can redirect it from blowing outside to actually blow inside of case AND install dust filter outside of case like I did. Now it’s quiet UPS and I can clean dust without opening case. Looking through internet magazines and forums, I found everywhere the same subject: people are using devices called NAS (Network Attached Storage). The range is from very simple devices based on very power efficient ARM CPU with 1 or 2 GB of memory and 1 or 2 hard drives usually connected in RAID 0 or 1 or simple JBOD (Just Bunch Of Disks) to server type with 16/32GB ECC memory and many hard drives (from 4 to 8 usually). Also, in the middle of this bunch, they are companies like QNAP or Synology, where you can have 2-8 hard drives all in very nice cases ready to set up and run… But… Not many people, actually have any clue what they want from this new gold aka NAS device. GROUP B: Here are devices from QNAP or Synology. They have a better hardware and software, they use better memory with error correction (we will talk about it later), also they can use many more hard drives (usually up to 8). They have their own proprietary system with GUI, but you can do a lot more than with those devices from group A. Speed can be easily twice more (we are talking about SMB connection for simplicity), but… apart of replacing hard drives, there is not much you can do. Those devices are designed for users with bigger needs also with bigger knowledge and bigger pockets (and we are talking hundreds of dollars). GROUP C: This is the most configurable, but the most complicated group of all, is also the most rewarding for you. Once configured, you will not have to do it again, but configuration process can be a bit of pain… Creating your own NAS from scratch: choice of CPU, motherboard, memory, hard drives, casing… I made my first NAS out of spare parts, I found around my home. It worked better than any of devices from group A. For free. It was my breakthrough when I discovered something called ZFS. “Zettabyte file system”… Zetta… what?! It was something that no other device from group A or B did have. I discovered that it was my ideal file system to store what I need to store. Let me explain: I needed storage to hold my backups from windows, family photos, movies… etc. Usually, I had a spare hard drive, on my desktop where it was formatted in NTFS and I could access it via network simple by share it… It was simple and it worked, or at least I thought it was working… but it didn’t. There is something called a “bit rot” I wasn’t aware of, but I had a first-hand experience: one day I could find some of my pictures half or partially shown, everything else was black or blue… part photo, part plain colour. At the time I didn’t put too much weight on it, so I left it as it was. Bit rot is when somehow, on your hard drive, one small bit change its state from 0 to 1 or from 1 to 0 without you knowing. “It’s nothing” you will say, but “ONE” bit in the middle of JPEG will render rest of this jpeg plain. This is what’s happened to my family photos. Not much trouble with movies, it will probably just skip frame or few, but for jpeg, it was a killer. Then, I couldn’t decompress some files by 7-zip. “Decompressing error” will say… I start searching and found the reason… It not always will happen, but filesystems like NTFS, EXT2/3/4, don’t have any safeguards for this type of error. ZFS does. It safeguarding against many other troubles like erased files. On ZFS they are not erased but temporarily removed, you can always bring them back unless you have no free space and system needs to save information in those areas, where your erased file was… self-healing when it finds problems… and many more. You need to read about it in depth to find all the perks. For me it was the 4 things: RaidZ2, compression, safeguarding against errors and self-healing. Compression can be enabled, so any file being dropped onto those hard drives are being compressed on the fly. Yuppi! 100GB of Windows 7 backup, will not take 100GB anymore! RaidZ2: it was like a song sung to me from far future. Imagine: 6x 500GB hard drives working together as one, where you can sustain 2 hard drives die on you at the same time… Now, they say that RaidZ1 is an equivalent of Raid5, RaidZ2 –>Raid6, RaidZ3 –>Raid7… It’s not entirely true and normal Raid system will not have any of the benefits of ZFS system but many of shortcomings like trouble when you interrupt power when Raid5 is writing a file (so-called “memory write hole”, no problem for ZFS). OK, enough of theory, you can read for yourself and there is a lot of info out there, just have a look. What they will NOT tell you (mostly) is the hardware needed for all that stuff. Of course, you can base all of it on Intel and you will pay a premium for it (“I’ve got INTEL MAN!”) or simply you can scavenge AMD on the cheap and have working NAS in no time with minimal money spend. First of all, I want to point out something: the need for ECC memory. There are many schools whether to get them or not, I think that you WILL NEED THEM sooner than later. Why? I had my first production NAS based on Asus motherboard P8H77-I with 6x SATA, ITX size, 2x DDR3 (up to 32GB) and CPU Intel Celeron G1610 @ 2.6GHz, 6GB RAM @1333MHz NON-ECC and 4x500GB hard drive in Raid10. Also, using ZFS with no ECC memory was missing the point. Imagine: If ZFS read block and this block gets corrupted in memory, it will think that blocks on HDD are bad and rewrite them with bad ones…IE whole pool is lost… ECC prevent it from happening and I had first-hand experience with mine where I had memory @1600MHz and AMD CPU could use a maximum of 1333MHz. Of course, memory gets corrupted and system has done all it could: reset before you could use this bad memory block. To be honest… there are many “theories” whether you must use ECC memory or not, for me, I want to be sure, that “all gaps” are being filled. So, AMD was next in line. After spending hours on the internet finding out what CPU & motherboards can use ECC memory, I’ve found that only ASUS will state its support for ECC, some people had luck with Gigabyte, but others are ignoring this feature. I wanted the latest generation, so I went for an AM3+ motherboard and having experience with ITX, that they are too expensive for what they are I wanted MATX. ASUS M5A78L-M/USB3 was the one. 4x memory slots with ECC support “up to” 32GB, 6x SATA2.0, 2x PCI, 1x PCIe x1 (for Intel LAN card), PCIe x16 for HBA card if ever needed… All I ever need it was there for the price of £49.99. Smashing. CPU: I had Celeron G1610 before and it NEVER went more than 30%, so all I need was to find something with low thermal envelope and at least half of Celeron’s power. AMD 210e with 45W TDP fit the bill perfectly. It cost me £26 on eBay. Memory? I was to use 6x 500GB so, a memory I needed was like 4 GB, but I go eBay to run for its name and got 2x2GB for £12 and 2x1GB for £6. Nice. All of them 1333MHz. 3U casing cost me another £60. All in about £150. This is what I like. Operating System: I chose NAS4Free. Simple, it will do all I need and more, forum guys are stars, very easy to deploy. Whole set: Right now, I have a 32GB ECC @1333 (eBay again @ £70 a piece of 16GB 1600MHz) memory and planning to increase from 6x500GB to 6x2TB, hard drives are: 2x Hitachi 7200.C solid hard drive, 4x Seagate 7200.11 (2 dying slowly). I have to say that Seagate has a bad name after 7200.11 series as they will just die on you. Performance: 80MB/s writing and 85MB/s reading constantly around it. As for Realtek NIC, it’s a good result. Enough for me. I may fiddle with Intel CT NIC cards to see if I can squeeze more or just wait for new hard drives. NEW hard drives: I need to replace two of them, so I think I will start to update what I have. There are 3 options: Standard WD RED 1TB @ £47 with 3 years warranty, WD BLACK 1TB with 5 years warranty @ £56 or throw me into darkness with Toshiba (rebranded Hitachi) 2TB for £56 including delivery and 2 years warranty. I like darkness… I’m working nights 😉 Toshiba!!! I’m coming!! !